Dunae Crenwelge, a 2011 Most Valuable Student scholar sponsored by Kerrville, Texas, Lodge No. 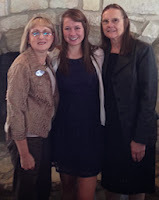 2081, had the opportunity to connect with Elks members at the Texas State Elks Convention on October 19, 2013. Dunae attended the convention with her MVS Named Scholarship Donors Shan and Mike Clark. Read her recap of the experience. Last weekend, I found myself speaking in front of a crowd of Elks about how my Most Valuable Student scholarship has helped me throughout my collegiate career. 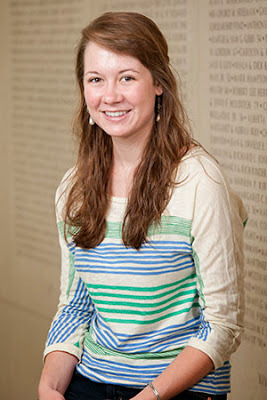 I’m a 2011 recipient of the Emma Whaley Byars Memorial Most Valuable Student Scholarship sponsored by Michael and Shan Clark. Over the course of five semesters at Texas A&M University, this scholarship has really proved its value. Dunae speaks on her experience as an Elks scholar. 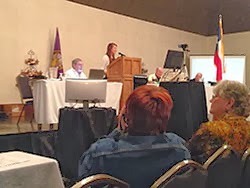 I was asked to speak at the 2013 Texas Elks State Convention by Danny Holman, TESA Youth Activities Chairman, who said that the Elks don’t often have the opportunity to hear from scholars so near the conclusion of their education—I’ll be graduating with a degree in communication and minors in history and comparative cultural studies in May. I was at the convention only for a few hours, but I could tell that the Elks are extremely passionate about supporting education and veterans. A topic that warranted constant address, however, was that the Elks are losing members as Lodges across the U.S. close each year—leading to the growing question of how the Elks will have the numbers and financials to support their work. The Elks may face a challenge, but in the face of this challenge, it’s important to reflect on the impact the organization makes every year in awarding 500 scholarships to the best high school seniors in the country. It’s also important to remember that these MVS scholarships continue to have an impact for students beyond being awarded—and this is the point I wished to make to the audience. The MVS scholarship has been tremendously beneficial to my college education. Not only has it provided crucial financial assistance, but it has also motivated me to perform well academically. I hold a 4.0 at Texas A&M, and in part this has to do with not wanting to disappoint the donors funding my education. Texas A&M is without a doubt one of the nation’s top public and research universities (and arguably the best public university in Texas…Gig ’Em! ), and any graduate will agree that it is more than a school—it’s an experience. I’m able to experience tradition, spirit, leadership, challenges, and the thrill of football games (a.k.a. Johnny Manziel)—all with the help of the Elks. The best part of the TESA Convention was that I was able to meet my MVS Named Scholarship sponsors, Mike and Shan Clark, after having communicated with them regularly via email. It was nice to finally put faces to names! I felt that it was important to thank them in person for the experiences and opportunities they’ve provided me through this scholarship. Thank you, Elks, for all that you do.